We are very proud to have been given 5 stars on the Brighton & Hove ‘Scores on the Doors’ scheme. Limited car parking is available on our forecourt, available when visiting your relative. 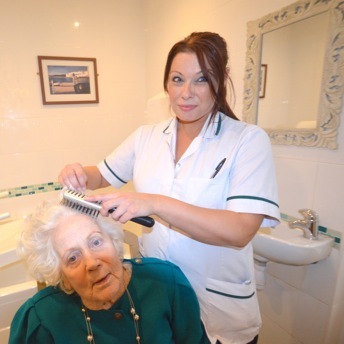 Extra services such as visiting hairdressers, chiropodist and optometrist are charged separately and this information is available from the home. The occupational therapist provides weekly activities that restore muscle strength and usefulness. An activity such as daily walks, dancing, ball games, art-painting and armchair exercises helps build up the Resident's arm and leg muscles, while helping our Residents retain their coordination skills. An annual expert Audiologist service is provided by a local company who set up their testing equipment and provide a unique service within our home to offer Hearing Aids to our Residents. Our visiting local Chiropodist is a welcome professional who offers our Residents six-weekly full foot and nail specialist care service within our home. Annual sight tests are provided by a local company who set up their latest eye testing equipment and are able to diagnose any glaucoma or medical condition as well as checking any deterioration in Residents' vision. If our Optician recommends a new prescription, then the Resident may chose from a wide range of varying-priced glasses. Our Optician provides a free, personal, discreetly engraved frame for Resident's who order new glasses.